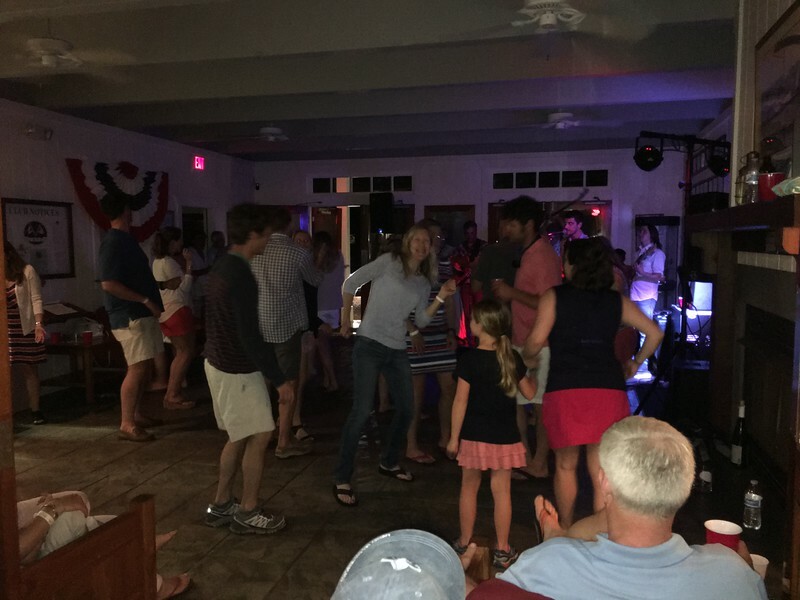 This the 3rd annual Open House Regatta which has become one of my favorite events at FBYC given the mix activities, people and sailing being done. 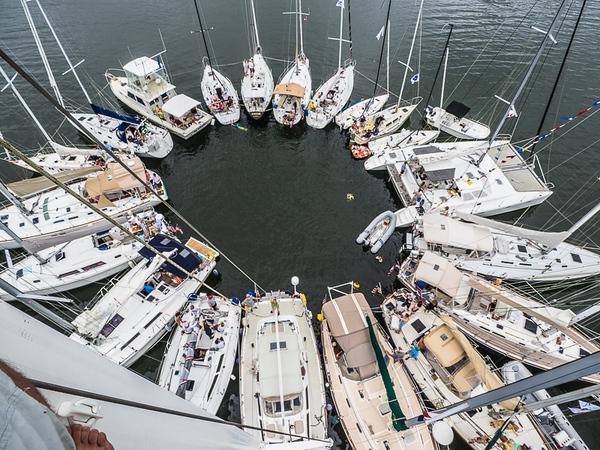 A bring-what-you-got progressive start race for boats 10-50+ ft all racing each other. 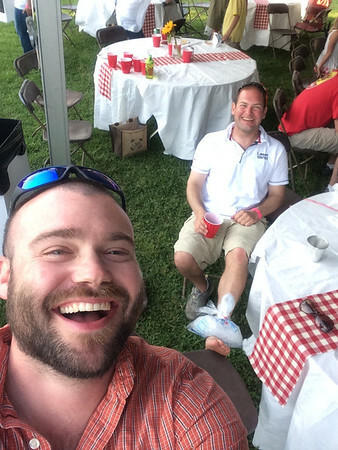 Followed by rafting up and socializing followed by dinner and a great blue grass band. Given I would be sailing my J/70 in Hampton next weekend, it was packed up yesterday and so today I joined David Hinckle and Tommy Roper aboard David’s J/70 – Air Speed. We had a good start and did well in the light air on the way out. On the way back we picked the wrong side of the course and let Nostalgia sneak by us while we couldn’t quite catch any of the boats ahead and settled for 6th. After returning the boat to the dock I took a launch out to the raft up already in progress. I managed to go boat-to-boat around the entire circle visiting with folks on each boat. 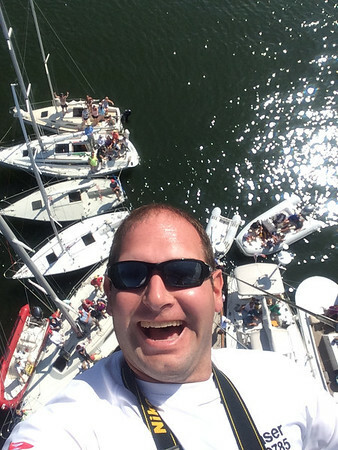 I also got to go up the mast of one of the larger boats to capture an aerial view. And despite a little crummy weather late in the evening, we still had fun inside. 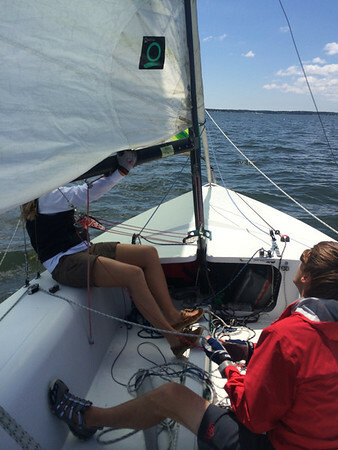 After last year’s successful regatta FBYC held their 2nd Open House Regatta and No Quarter J/70 was among the 30 boats sailing the 8.5nm course in the Piankatank River. 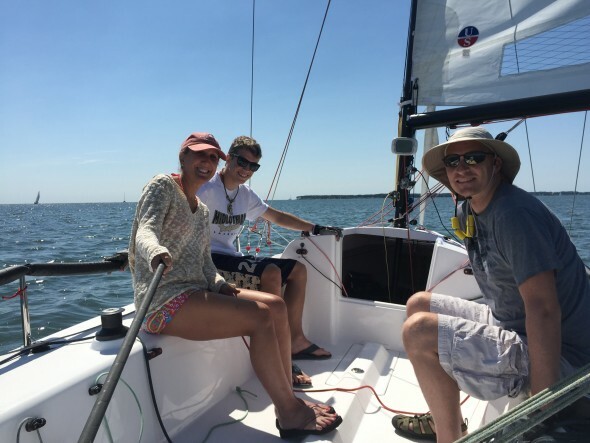 In the spirit of being a fun casual race – I invited a couple co-workers with me who hadn’t sailed much. 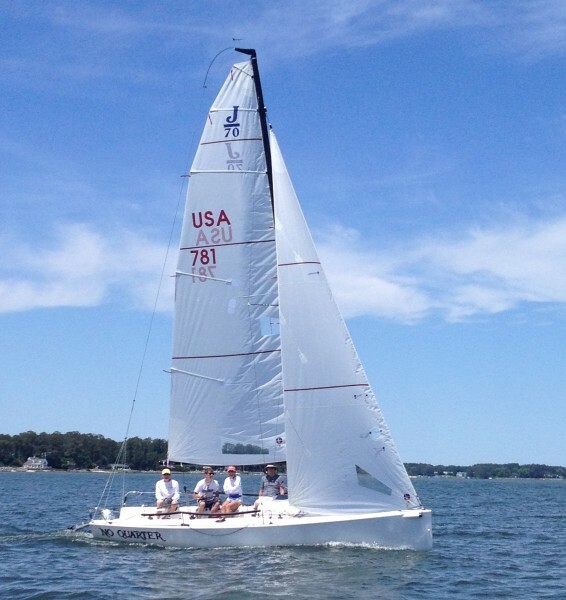 Fishing Bay Yacht Club‘s first ever Open House Regatta was Saturday. 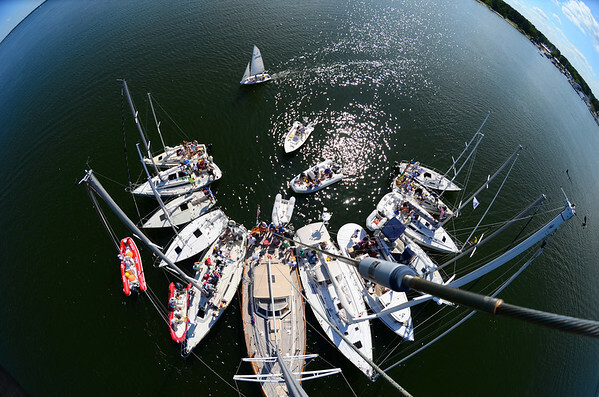 This year we tried something new and replaced a distance race for the bigger boats-only with declining participation with a shorter distance race for all boats held at the club and on surrounding waters. It was cooling being part of the group that came up with the ideas last November and seeing it carried out and how well it went and how great of a time everyone had. 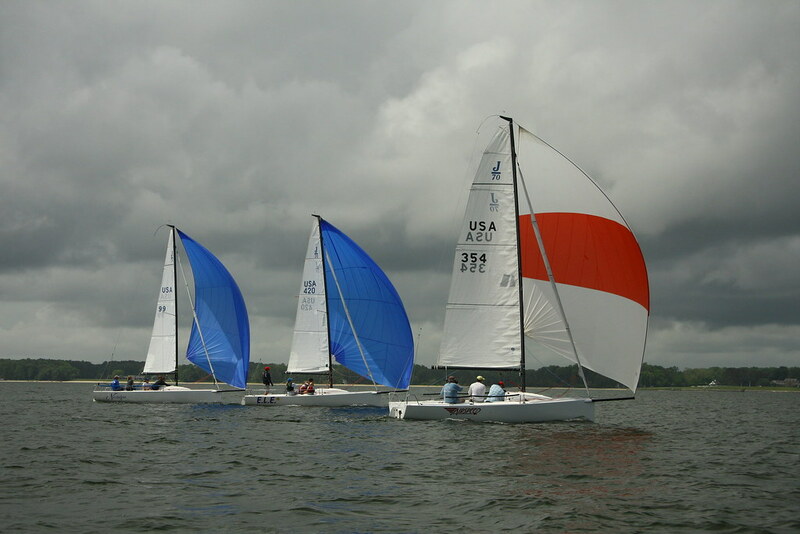 The goal of the event was to have racing at the club – since it’s centrally located where we all like to go anyway, and it’s a holiday weekend so everyone is down at the river. We also wanted to involve all of our boats and to invite friends to come racing with us in some casual racing. We finished it up with a raft up and dinner/band in the evening. Caroline Garrett, Elizabeth Staas, Len Guenther, Mark Hayes and Matt Braun and all of the other volunteers did a great job making the ideas a reality. I sailed a Front Runner and introduced fellow member Christin Lipscomb and her boyfriend Mike Walsh to the boat as my crew. It was my first time on the boat in nearly a year. The race was a progressive start race – meaning the slowest boats start first and the fastest boats start last and whoever crosses the finish line first wins. The different start times handicap the boats based on their speed. 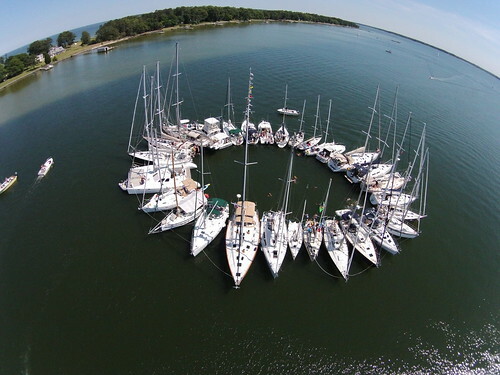 There was a second progressive start for the >22′ boats which sailed an even longer course. Our race went alright. We didn’t have the best first leg and weren’t able to catch the breeze that allowed the boats ahead to really stretch out and not get caught in a wind hole further back. We had fun and still managed a 6th place and 3rd Front Runner to finish. There were a few other fun moments like where we were unsure which side of the mark we were to round and had boats going both ways. After racing we put up the boat and joined the raft up of the bigger boats as they finished. The goal was to make a sunflower where we complete the circle of boats, but we fell short a few boats and ended up with a crescent. Still it was a fun time having everyone rafted up together hopping between boats and catchup up with everyone and seeing how their races went. 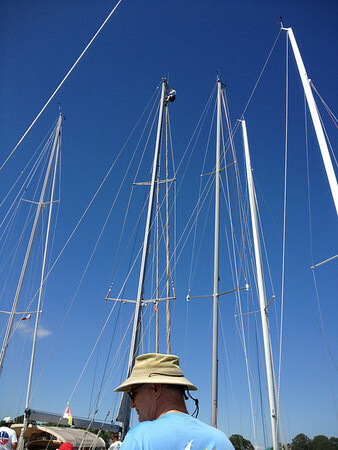 Once we had most of the boats rafted up – I went up the nearly 70′ mast on Destiny to get a picture. Post-raft up I bumped into a Flying Scot sailor at the dock and sprained my ankle which left me laid up icing it for the rest of the evening.